Welcome to the Wingland Elementary Website! As principal I am very pleased to welcome you to our website and our school. 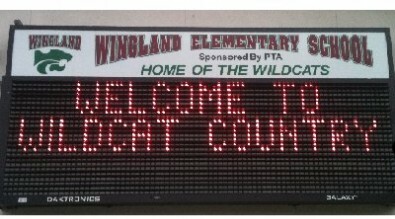 The staff at Wingland Elementary School is dedicated to meeting the needs of all students. Our teachers are committed to providing each student the opportunity to achieve his/her highest potential. We strive to provide a school where students and staff are recognized for their achievements, feel safe in their surroundings, and are treated fairly. Wingland Elementary School provides a comprehensive educational program with high expectations, a positive atmosphere, and the opportunity to develop positive self-esteem. We believe that a partnership between parent, student, and staff provides a firm foundation for an excellent educational setting. By working together, Wingland Elementary students are provided the support necessary to be successful and productive citizens. Student safety is a major concern therefore at 8:20 each day; the perimeter gates will be locked. Any late students or parents coming to our campus will be required to come to the office to check in before going to their classrooms. Welcome! I hope to meet you all soon.